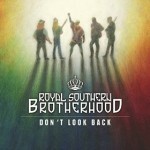 Share the post "Album review: ROYAL SOUTHERN BROTHERHOOD – Don’t Look Back"
And so it comes to pass that the bloodline has been cast asunder and a new line-up of Royal Southern Brotherhood takes on the mantle of the kings of southern kissed funk, blues and soul. ‘Don’t Look Back’ – subtitled ‘The Muscle Shoals Sessions’ – is a departure, but the important thing is the song quality remains the same. Out go Mike Zito and Devon Allman and in comes Bart Walker and Tyrone Vaughan (Jimmie’s son and Stevie Ray’s nephew – a new bloodline of sorts). Cyril Neville remains at the helm and the stonking rhythm section of Yonrico Scott and Charlie Wooton continue to nail the grooves. The upshot is a rootsier direction that takes the band back to its New Orleans musical roots with lashing of funk, counter-balanced by hard edged blues-rock, mixed back guitars and an ever present soulful feel on deeply entrenched grooves. Cyril dominates the collaborative songs and sparks the band’s performance, as he stamps his authority on a musical vehicle that strains at the leash in different directions. Listen to the opening ‘I Wanna Be Free’ and you can hear the genesis of the new band as Vaughan and Walker trade licks. It’s a guitar axis that once it embraces a full blown song writing partnership will give the band variety and added dynamism. As it is, the suitably titled ‘Don’t Look Back’ is an album the band needed to release quickly to reshape their identity and tour behind. Inevitably, it’s the kind of album that might have made a bigger impact had it been recorded either in the middle or after the current world tour. That said, any semblance of hesitancy is over ridden by a roll call of guests including Jimmy Hall, Wet Willie and Ivan Neville. ‘Reach My Goal’ rolls along like a freight train, as guitars percolate on the outro, while the same guitar combination takes on a harder edge and positively rages on the suitably titled ‘Hard Blues’, which mirrors the lyrical anger of the song. Tyrone shines on the closing ‘Poor Boy’, a track that perfectly fuses all the elements of the band to give it a Stevie Wonder vibe. The title track has a funky rootsy feel, and ‘Hit Me Once’ is another delicious funky groove, underpinned by Yonrico’s crisp percussion work, as the band stretch out and finds it’s feet as a new combo. There are some impressive harmonies on the soul ballad ‘Better Half’ and they explore Latino influences on ‘Penzi’, a Cyril and Charlie Wooton co-write. You can almost feel the guiding hand of (Buddy Guy/James Cotton) producer Tom Hambridge who imperceptibly glues everything together in a coherent fashion. If their last album ‘Heatsoulblood’ stood on the brink of defining their musical style, ‘Don’t Look Back’ deflects the more primal rock impulses and refashions them in a more rootsier vein. ‘Don’t Look Back’ strikes a working balance which you imagine will be stretched hither and thither, as the new band members come to contribute more. This entry was posted in ALBUM REVIEWS, ALBUM REVIEWS (Mobile), All Posts and tagged album, Bart Walker, blues, Buddy Guy, Charlie Wooton, Cyril Neville, Devon Allman, funk, Ivan Neville, James Cotton, Jimmy Hall, Mike Zito, review, rock, Royal Southern Brotherhood, soul, Tom Hambridge. Stevie Wonder, Tyrone Vaughan, Wet Willie, Yonrico Scott. Bookmark the permalink.